Amanuensis: A person employed to write what another dictates or to copy what has been written Iby another. This week, in honor of Memorial Day, I looked through various wartime documents. I decided to transcribe the World War I draft registration of Aaron Feinstein, the youngest brother of my great grandfather, Herman Feinstein. 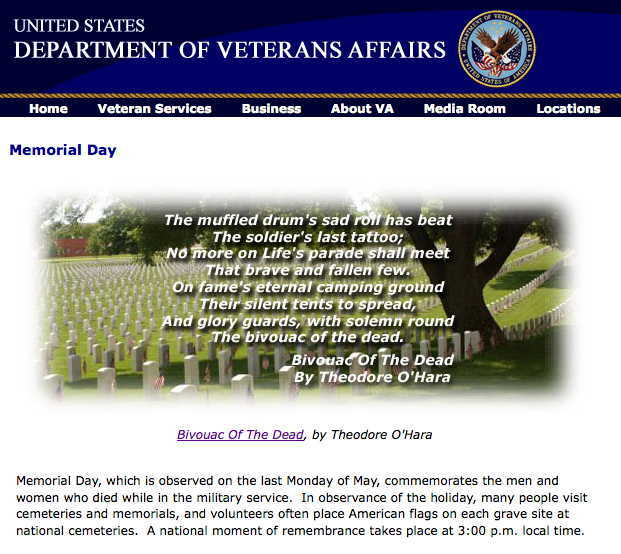 In honor of Memorial Day, below are the names of ancestors, and their siblings, who I know served their nation's military, either in a time of war, or in a time of peace. It's time for 106th edition of the Carnival of Genealogy, and the theme is the 4th annual Swimsuit Edition. I participated in 2008 and 2009, but missed participating last year. 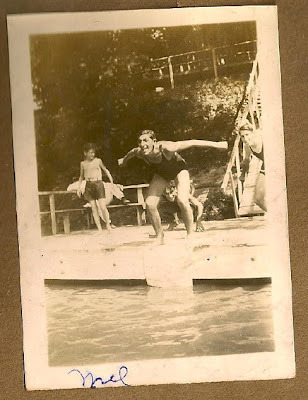 This year I'm sharing a photograph of my grandfather, Melvin Newmark, about to jump off a dock. The year is approximately 1930, and he's wearing a one-piece suit that was common for men in the era, but would be rare today. The photograph comes from my grandmother's scrapbook, so I assume she was the photographer, though the photograph pre-dates their 1936 marriage. I don't know the other individuals in the photograph. The child in the background would be about the right age for my grandfather's younger brother, Mandell (born in 1923), though the kid in the picture appears to have slightly darker hair than other photos of Mandell I have at that age. Though it could be a matter of lighting. One aspect of Kabbalah, a Jewish form of mysticism, is the interplay between numbers and letters. Notarikon – A method of using the initial and/or final letters in a group of words to form words/phrases. My great-great grandfather, Moshe Leyb Cruvant, was referred to as Moshe Leyb "the king" by at least one of his daughters, probably as a Hebrew joke, based on the initials of his name. (The Hebrew letters of Mem-מ, Lamed-ל, Kopf-ך spell the word, Melek-מלך, meaning King.) This is a usage of Notarikon. Similarly, Moshe Leyb was honored with several grandchildren, one named Melvin Lester, another Monroe Leslie, and a third Morris Louis. 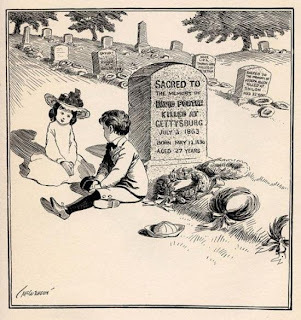 Without knowing the importance of initials in mystical thought, this might appear to be a coincidence of names instead of grandchildren being named after their deceased grandfather. Note: Leyb is the Yiddish word for Lion. Leyb was one of several new animal names which became popular in the European Jewish community in the 18th century. Prior to that animal names were common, but were limited to those that had appeared in the bible. Philip Trauring at Blood and Frogs writes more about Jewish animal names. Many immigrant Jews Americanized their names, and often they did this by finding a common American name that began with the same initial letter(s). Until recent research, I thought Vulf Perlik's name was "William" as that is how it was recorded in our family documents. 'William,' of course, shares the first two consonants with 'Vulf.' (Like Latin, and some other languages, there is no 'W' sound in the Hebrew alphabet.) Vulf didn't immigrate, but some of his children 'changed' his name to 'William' in the oral history. Similarly, another ancestor's Hebrew name was 'Zvi,' or 'deer.' The Yiddish variant is 'Hirsch', and a common Americanization is, "Harry.” Without knowing the animal names, and the process of Notarikon, one might be very confused how the name 'Harry' was derived from 'Zvi'. This tradition of using the initial letter or letters to change names can be useful for parents in naming their children if an ancestor had a name that is uncommon today. Gematria – A method of assigning numerical values to letters, calculating the numerical value of words/phrases, and associating them with other words/phrases of matching value. Perhaps the best known example of Gematria is with the Hebrew word, 'chai,' meaning 'life.' Formed with the Hebrew letters Chet-(8)-ח and Yod-(10)-י, the numerical value is 18. Many Jews will give charitable donations in multiples of $18 to symbolize 'life'. Leah is a very common Hebrew name for girls. The reason goes beyond her appearance in the Torah as one of Jacob’s wives. Her Hebrew name לאה (Lamed-30-ל + Aleph-1-א + Hay-5-ה) is equivalent to 36, or double 18. The Bible Wheel has a Biblical concordance, including the New Testament, and allows you to search for words using the English translation, though it uses the King James Version of both testaments. Numberman’s Gematria Calculator is useful if you already know the Hebrew characters for the word you are looking up. Above the English surname, in the middle of the Star of David, are the letters Pay-Nun This is an abbreviation for Po Nikbar, meaning "here lies." The first line of Hebrew reads: "Meyer Vulf." The second line reads: "Bar (son of) Samuel Yosef Newmark." It is the third line where numbers are first used. The first word is "Niftar" meaning "Died." The second word is: Yod (10) - Daled (4). The third word is Sh'vat , the name of a Jewish month. The final word is: Tav (400) - Resh (200) - Tzade (90) - Aleph (1) . So the date of his death was the 14th day of the Hebrew month of Sh'vat, in the year 5691. (Remember, the first digit of the year is usually dropped.) This converts to Feb 1, 1931. I happen to know Max died on January 31. Why is it a day off? Because he died after sunset, and the Hebrew day begins at sunset on the previous Gregorian date. The final line of Hebrew is clearly an acronym on this tombstone, but the periods are often removed, and it appears as if it were a single word. It is usually at the bottom of a stone, as it is here. It's based on a biblical passage from the Book of Samuel (25:29) and translates to: "May his soul be bound up in the bond of eternal life." 2) (Avgad) A becomes B, B becomes C, C becomes D...Z becomes A. 3) (Albam) A exchanged with N, B exchanged with O, C exchanged with P…M exchanged with Z.
I don't know of any examples in my family tree, where names were created using one of these methods, and I haven't heard of it happening in other families. However, there is one example from literature. Some creative readers suggested that Arthur C Clarke came up with the name for his misbehaving computer in the novel, 2001, through a reverse-Avgad technique -- HAL being derived from IBM. Clarke has denied this, insisting it was a coincidence, and that the name is actually a Shakespearean reference to Henry V, referred to as Prince Hal in the drama, Henry IV. Clarke probably expects readers to believe that since he is British, he is more likely to make a Shakespearean reference than a reference to an American computer company. Yeah, right. I've not been trained in any of these methods specifically. I knew about gematria growing up solely through the importance of Chai and the number 18. Some examples appear in the book/film The Chosen by Chaim Potok, which I remember reading in high school. I read the book, The Bible Code a few years ago which goes into some more detail. I've been fascinated with numerology for a long time.. When a nephew was born at 6:37 pm, I 'rounded down' in 'military time' to 18:36:54. I'll now never forget the time he was born. Interestingly, I discovered in my maternal grandfather's address book that next to my birthday was written the time I was born. (12:05 pm) I have no idea why it interested him, but the time is not written next to any other birthday. Jokes have been made over the years that I was 'born just in time for lunch." It's been almost six months since the last installment, but I return with the Surname Saturday blogging meme. Discuss a surname and mention its origins, its geographical location(s) and how it fits into your genealogy research. Lichtman is an occupational surname for a chandler, being derived from Likht, the Yiddish word for candle. My Lichtman ancestors were from an area of Transylvania, at the time under the rule of Austria-Hungary. Today the towns are part of Romania. My great grandmother Helen (nee Lichtman) Deutsch immigrated to the US in 1912, settling in Chicago. A few of her siblings immigrated around the same time, while a few others remained in Hungary. Of those who remained, most died in the Holocaust, though two nieces survived, and made it to Israel in 1964. One of their daughters made contact with our family a couple decades ago. I know less dates for this surname branch than some others, but I include the information I do have. The numbering below follows the d'Aboville system, slightly modified to indicate half-siblings. The first digit represents the order surnames make their first appearance on my ahnentafel. I've emboldened my direct ancestors, and __s indicate living, or potentially living, relatives. 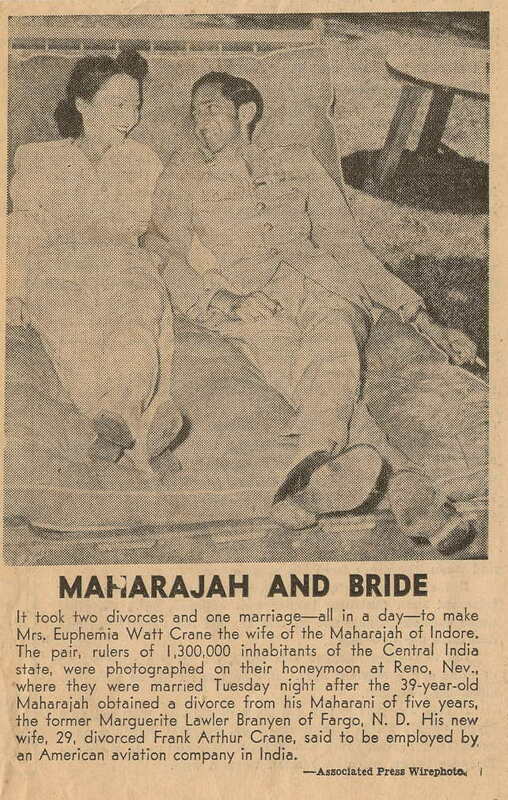 This news clipping was found with other wartime clippings saved by my maternal grandmother, Myrtle Van Every Deutsch. Following the guidance at Blood and Frogs, I have been ordering several batches of Naturalization Records from the National Archives (NARA) recently. The cost is inexpensive at $7.50, and they don't charge for the research, so you only pay if they find something. There are a few others I could order. Barney's brothers Sol, Max and Israel David all went through the citizenship process. I have all three of their Declarations of Intent from the local library's microfilm. However, there are no current mysteries that their petitions are likely to solve. This is frustrating. This is the only paternal branch of mine that I don't know the European city of origin. Selig's brother-in-law, Jacob Perlik, has Szdobirtzen, Russia and Szdobeitzen, Poland on his petition and certificate respectively -- though no city with those names can be found. The closest phonetic match I can find is Dobrzyn, though this is a guess. I was informed by NARA that the naturalization didn't occur in a Federal Court, and was told the records could be retrieved from the Missouri State Archives. They provided court, volume number, page number, and date. (I knew about the Missouri State Archives records, but was curious if NARA had anything additional.) I wasn't charged for this information. As with Morris Cruvant, NARA informed me they had no records, as this wasn't a Federal naturalization, and provided me with the information necessary to retrieve the records from the Missouri State Archives. This also isn't a Federal Naturalization, and I have requested the documents from the Cook County Illinois court. When you're dealing with unfamiliar geography, especially historical geography, maps can be quite useful. 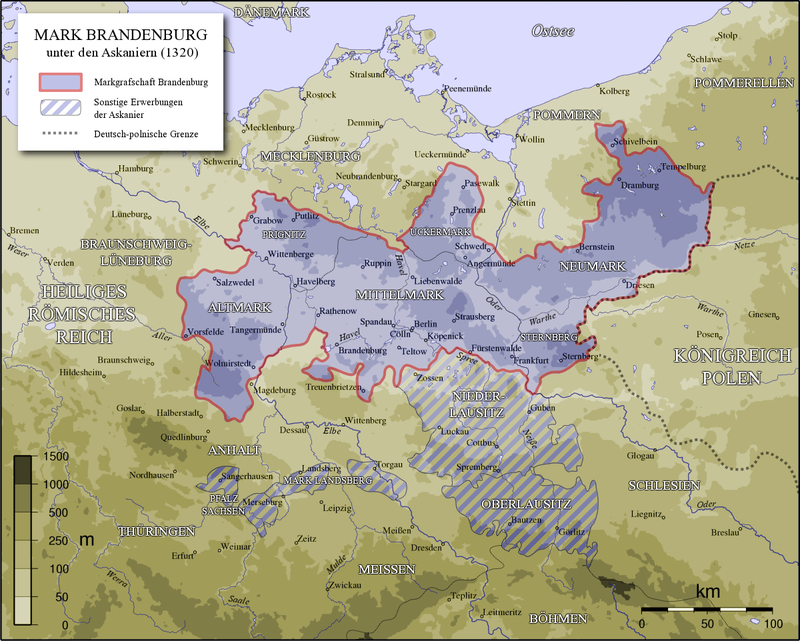 I found this map of 1320 Brandenburg. 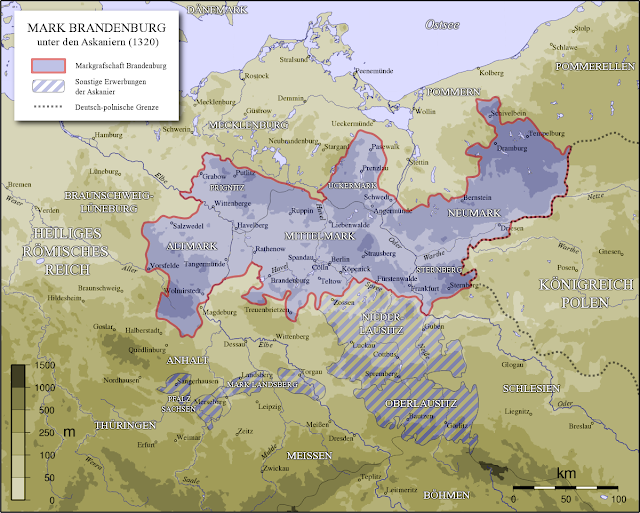 (source) It is believed the territory called Neumark is the origin of our surname. You can note that the Oder and Warthe rivers form one of the boundaries. I am only able to trace my particular Newmark ancestors back to Warka, Poland, near Warsaw. How did they travel there? They could have traveled most of the way by following Poland's river system, with minimal land crossing near Bydgoszcz. (The Oder and Warta rivers can be found in the upper left.) We have no idea when they left Neumark, and entered Poland. All we know is that they were in Warka by the 1880s. We wouldn't be who we are today without the loving mothers in our lives - past and present. Here are the eight female ancestors (besides my mother) for whom I currently have photographs. Last week I transcribed a newspaper article mentioning the gambling loss of Harry Feinstein, my great grandfather's brother, in a gambling raid in 1911. My parents suggested I look for some newspaper articles on Sid Wyman, a first cousin of my paternal grandmother's. So I did. I knew Sid had been a 'professional gambler' in Las Vegas, but I didn't know that he had been part owner of at least four hotels, and had made it into the Poker Hall of Fame. If I had conducted even the most basic search, I would have known this. It's on his Wikipedia page. My parents suggested finding some news stories from his younger days in St. Louis. Those are difficult to find. He was born a generation later than Harry Feinstein, and the St. Louis Post Dispatch archives from his youth aren't online. However, I did find a column from a California newspaper I wanted to share. And I did share it. However, in November of 2011 I learned that it was a reprint of a column from another newspaper, so I 'gambled' and requested permission from that newspaper. And was told I would need to pay $150 to keep the column on my site, which I decided was a bit hefty of a price, so I 'folded.' The article below has been deleted.